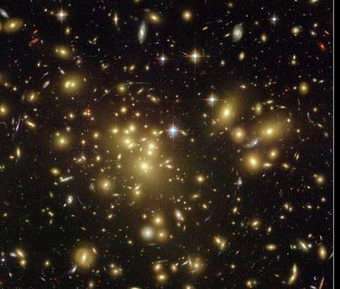 The light from galaxies in the background has been warped and “arced” by the galaxy cluster Abell 1689 in the foreground, and perhaps with some help by either dark matter or a stronger type of gravity on this large scale. Image Source: NASA, N. Benitez (JHU), T. Broadhurst (Racah Institute of Physics/The Hebrew University), H. Ford (JHU), M. Clampin (STScI),G. Hartig (STScI), G. Illingworth (UCO/Lick Observatory), the ACS Science Team and ESA. In the standard theory of gravity—general relativity—dark matter plays a vital role, explaining many observations that the standard theory cannot explain by itself. But for 70 years, cosmologists have never observed dark matter, and the lack of direct observation has created skepticism about what is really out there. Lately, some scientists have turned the question around, from “is dark matter correct?” to “is our standard theory of gravity correct?” Most recently, Fermilab scientists Scott Dodelson and former Brinson Fellow Michele Liguori demonstrated one of the first pieces of theoretical evidence that an alternative theory of gravity can explain the large scale structure of the universe. Although cosmologists have never directly observed dark matter, they have many good reasons for not giving up hope. The ways that galaxies rotate and starlight bends (gravitational lensing) stray from predictions based on visible matter. Further, the formation of large cosmic structures (such as galaxies and galaxy clusters) would have required significantly large matter perturbations when the Universe was less than a million years old that simply don’t exist in a theory of general relativity before “tacking on” dark matter. While altering the theory of gravity may seem like pulling the rug out from under a century of observations and pain-staking calculations, an alternative theory may simply be “more correct” than today’s standard theory. Just as Einstein’s theory was “more correct” than Newton’s because it improved upon the older one by noticing more specific details (e.g. extraordinary masses and speeds), a new alternative theory may only drastically change gravity at certain scales. The new theory (or groundwork for it) under investigation would be Jacob Bekenstein’s relativistic covariant theory of gravity (TeVeS), published in 2004. Bekenstein based his theory on a modified version of Newtonian theory from the early ‘80s, dependent on gravitational acceleration and called modified Newtonian dynamics (MOND) by its founder, Mordecai Milgrom. Dodelson and Liguori find Bekenstein’s theory intriguing in this context because, for one, the gravitational acceleration scale in the theory is very close to that required for the observed acceleration of the Universe. The scale is also very similar to that proposed in “post hoc” theories such as dark energy. Even more interesting is the fact that the origins of Bekenstein’s theory had nothing to do with cosmic acceleration. But the feature of Bekenstein’s theory that Dodelson and Liguori focus on most is that the theory—unlike standard general relativity—allows for fast growth of density perturbations arising from small inhomogeneities during recombination. Building on this finding from scientists Skordis et al. earlier this year, Dodelson and Liguori have found which aspect of the theory actually causes the enhanced growth—the part that may solve the cosmological structure problem. The pair has discovered that, while Bekenstein’s theory has three functions which characterize space-time—a tensor, vector and scalar (TeVeS)—it’s the perturbations in the vector field that are key to the enhanced growth. General relativity describes space-time with only a tensor (the metric), so it does not include these vector perturbations. “The vector field solves only the enhanced growth problem,” said Dodelson. “It does so by exploiting a little-known fact about gravity. In our solar system or galaxy, when we attack the problem of gravity, we solve the equation for the Newtonian potential. Actually, there are two potentials that characterize gravity: the one usually called the Newtonian potential and the perturbation to the curvature of space. These two potentials are almost always very nearly equal to one another, so it is not usually necessary to distinguish them. “In the case of TeVeS, the vector field sources the difference between the two,” he continued. “As it begins to grow, the difference between the two potentials grows as well. This is ultimately what drives the overdense regions to accrete more matter than in standard general relativity. The quite remarkable thing about this growth is that Bekenstein introduced the vector field for his own completely independent reasons. As he remarked to me, ‘Sometimes theories are smarter than their creators.’"
Dodelson and Liguori see this solution to large structure formation as an important step for a gravity theory based on baryon-only matter. Other problems that their theory (or any alternative theory) will have to confront include accounting for the mismatch in galaxy clusters between mass and light. Also, the theory must conform to at least two observations: the galaxy power spectrum on large scales, and the cosmic microwave background fluctuations, which correspond to baby galaxies and galaxy clusters. Citation: Dodelson, Scott and Liguori, Michele. “Can Cosmic Structure Form without Dark Matter?” Physical Review Letters 97, 231301 (2006). one attract the other repel . Both energies exist in perfect equilibrium with earth. Ter, considering that we have exactly 100 %. Energies around it, this make gravity to cause bodies go down against earth . Under this condition bodies do not go down , they tend to float . I think the origin of gravity is an oscillation of electrostatic forces. The oscillation is added to another oscillation. The oscillation is very small compared with 1.6*10-19C. you can go on www.ag0.blogspot.com for more details. A. A note about "new Theory of Everything Breakthrough"
Mark Fiorentino Mar. 18, 2009"
2. Thus gravity is simply another face of the total cosmic energy. Thus gravity is THE cosmic parent of phenomena such as black holes and life. It is the display of THE all-pervasive-embracive strained space texture, laid down by the expanding galactic clusters, also noticed in the expanding energy backlashes into various constructs of temporary constrained energy packages. 3. "Extrapolation of the expansion of the universe backwards in time to the early hot dense "Big Bang" phase, using general relativity, yields an infinite density and temperature at a finite time in the past. At age 10^-35 seconds the Universe begins with a cataclysm that generates space and time, as well as all the matter and energy the Universe will ever hold." At D=0, E was = m and both E and m were, together, all the energy and matter the Universe will ever hold. Since the onset of the cataclysm E remains constant and m diminishes as D increases. At 10^-35 seconds, D in E=Total[m(1 D)] was already a fraction of a second above zero. This is when gravity started. This is what started gravity. At this instance starts the space texture, starts the straining of the space texture, and starts the "space texture memory", gravity, that will eventually overcome expansion and initiate re-impansion back to singularity.